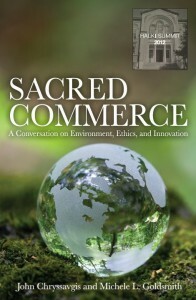 In June of 2012, a group of distinguished religious leaders, environmentalists, and businessmen met to share together their respective understandings and assessments concerning the present and future conditions of our planet. During what is now called the Halki Summit, Jane Goodall, well-known anthropologist, discusses biodiversity, while Costa Carras, a leading environmentalist in Greece, responds to several presentations. Bill McKibben, founder of 350.org, offers sobering statistics and a call for restraint, and James Hansen, professor of environmental science at Columbia University, addresses the present and future effects of climate change. Gary Hirshberg, former president of Stonyfield Farm, relates by example how a business can be successful and environmentally responsible, while Amory Lovins, cofounder and chief scientist of Rocky Mountain Institute, reveals how the same may be done with the energy demand that fuels our businesses. Richard Chartres, bishop of London for the Church of England, discusses how we must exchange our economic calling, grow first and clean up later, for a new religious calling, one human race and one whole world. Lastly, Metropolitan John (Zizioulas) of Pergamon seeks to answer the question: “From here to where?” Sacred Commerce makes available their presentations, in which the creativity of business, the evidence of science, and the understanding of religion unite for the welfare of not only industrialized countries, but also for all human communities and living things now present and in our future.